I love learning about people and their real-life stories. I especially love the lesser-known stories of historical time periods. Today we celebrate Martin Luther King, Jr. and we also remember other great names in Civil Rights history. Did you know that some famous Civil Rights activists were children? Today’s IMWAYR title should be shared widely. I share here to remind myself and others that children CAN and DO make a difference in our lives and in our communities. 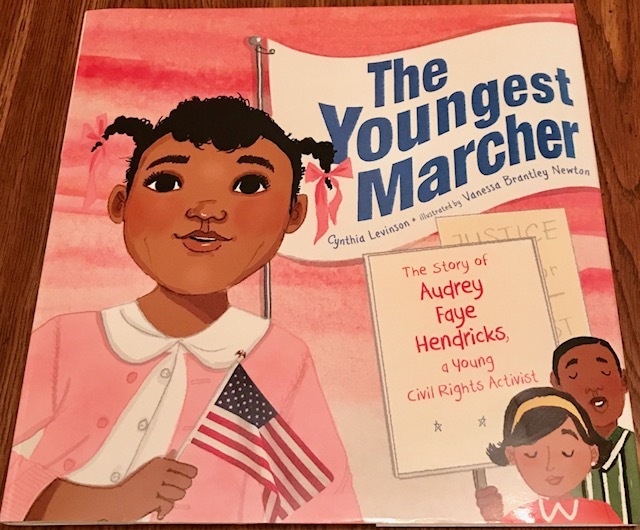 The Youngest Marcher: The story of Audrey Faye Hendricks, by Cynthia Levinson will stay with me for a long time. I know the stories of Martin Luther King, Jr.’s marches and speeches, and they have inspired me in the past. Last year when I read The MARCH Trilogy, I learned so much more from Representative John Lewis’ firsthand accounts and experiences. Now I am reminded (through a picture book — see, picture books teach all ages) that there were children arrested in May of 1963, one being Audrey Faye Hendricks, who was nine years old at the time. I thought, “NINE? They arrested 9-year-olds?” Yes, yes, they did, and by doing so, they filled the jails in Birmingham, Alabama. Amazing. Frightful. Inspiring. I missed this book when it released in 2017, but I am so glad I have remedied that. I recommend that you buy this book and keep it — read it when you need a good story about children being brave and changing the world.